The CIS interface has been designed to be as clean and informative as possible while letting you carry out any task you want with the minimum of fuss. Clicking the curved arrowed on the upper right lets you switch between the home screen and the more advanced tasks interface. You can instantly run a virus scan on a file or folder by dragging it into the scan box while 'Game Mode' means nothing will interrupt you while you play a full screen game. 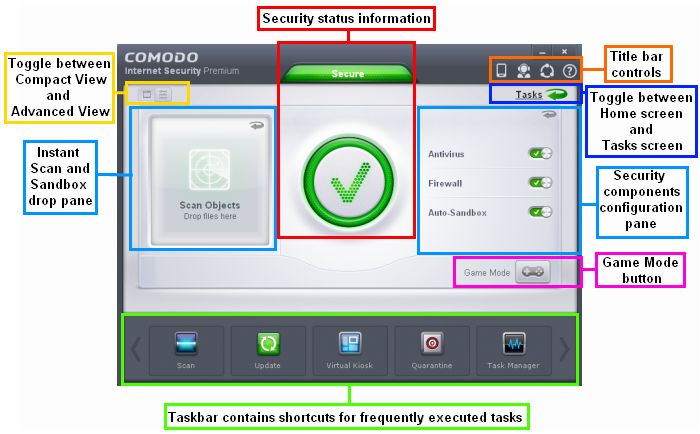 The Task Bar at the bottom of the home screen allows one-click access to important features such as the antivirus scanner, the Virtual Kiosk, the update checker and the CIS Task Manager. The home screen has been designed in such a way that you can flip the view between Compact View and Advanced View by using the toggle button at the top left side of the interface or from the system tray icon. The Compact View, as the name suggests, is compact and allows you to configure security components setting and run instant scans by dropping files or folders. 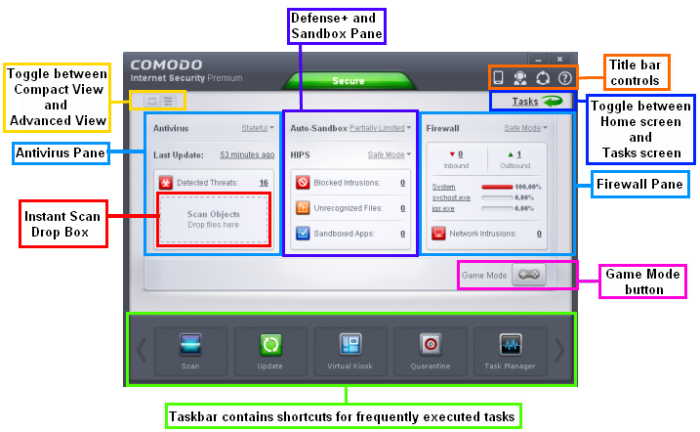 The advanced view shows antivirus, firewall and sandbox activity in greater detail. This includes the number of detected threats, last virus database update time, number of inbound and outbound connections and more. This view also allows you to quickly change security settings for each component.